On the occasion of Robert Rauschenberg‘s birthday, today, October 22nd, I’d like to take a look at his work and contributions to the art world. Rauschenberg is known for his “Combines,” in which non-conventional materials and objects were utilized in original combinations. He used found objects and images, including silk screened images, in his art leading some to say that he was a forerunner of American Pop Art. 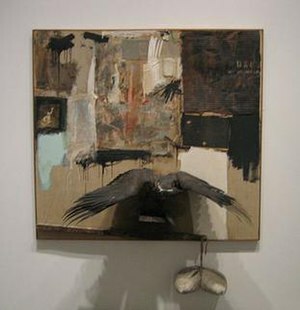 Rauschenberg died fairly recently, in 2008, at age 82 and he was still creating art almost right up to his death. I really like how his mind worked, how he’d make art out of boxes of trash, use newspapers, diagrams, and later in life, digital prints. He wasn’t so much about one specific medium or another or about art as culture I don’t think, but about combining all types of mediums and materials to bring a composition to life. He could turn anything into a piece of art. He was an experimenter, and I think it was through his artistic experiments that he became an innovator in the world of art. What are your thoughts on, or favorite pieces by Rauschenberg?